I arrived home late last night after a day of traveling from Quito to Miami to Jacksonville to Ocala. Sadie got one heck of a warm welcome from us (we are very grateful to my father-in-law for taking such good care of her) and it feels good to be back! Vacation was absolutely amazing, but I am also ready for a bit of normalcy. I still have a couple of vacation recaps coming your way today that I typed up on the plane yesterday. 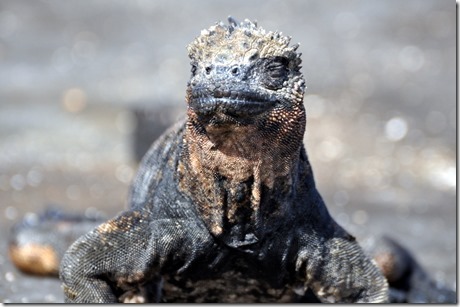 My final Galapagos Islands recap will pop up this afternoon while I am at work. Lots of scuba diving fun to come! 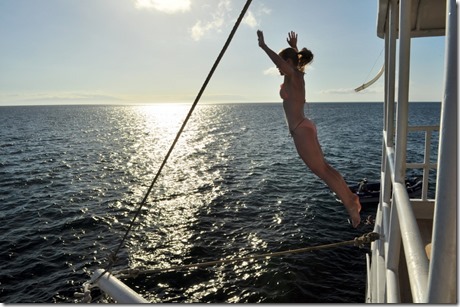 Before I had the chance to eat breakfast during our second day in the Galapagos Islands, some serious excitement occurred just off our boat. 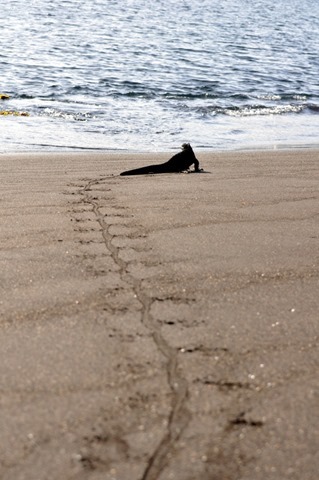 A bunch of sea lions were spotted playing on the shore of Santiago Island! Knowing we’d be visiting that very island in less than an hour had our group feeling pretty pumped about the day ahead. Since sea lions claimed the number one spot on my list of animals I was dying to see up close during our visit to the Galapagos Islands, I couldn’t wait to hop aboard a dinghy and head out to the beach. After two dinghies unloaded our small group a short while later, everyone took about 10 minutes to explore the wildlife on the shore before reconvening around our guide. There was so much to see! 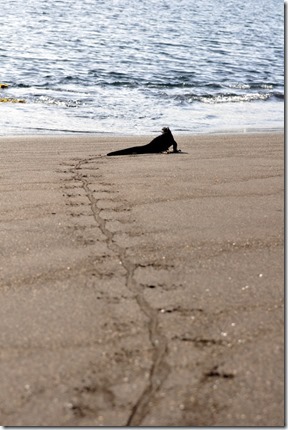 How cool are marine iguana tracks? The sun-drunk expressions on the marine iguanas’ faces absolutely cracked me up. 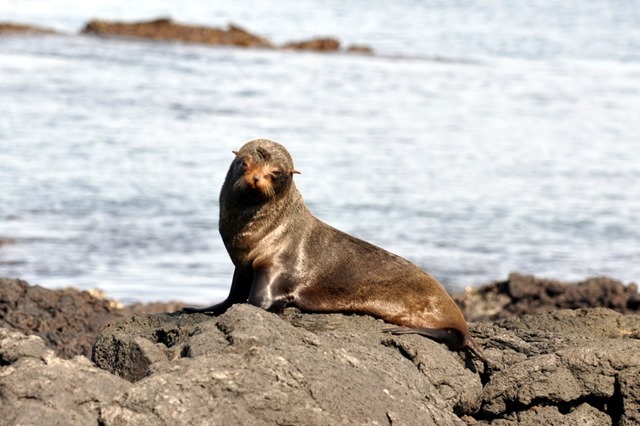 Naturally we couldn’t resist snapping a few pictures of the Galapagos fur seals! (The Galapagos fur seals are technically sea lions which our guide said you can distinguish because they have small but identifiable ears.) They were unbelievably adorable and quite curious. 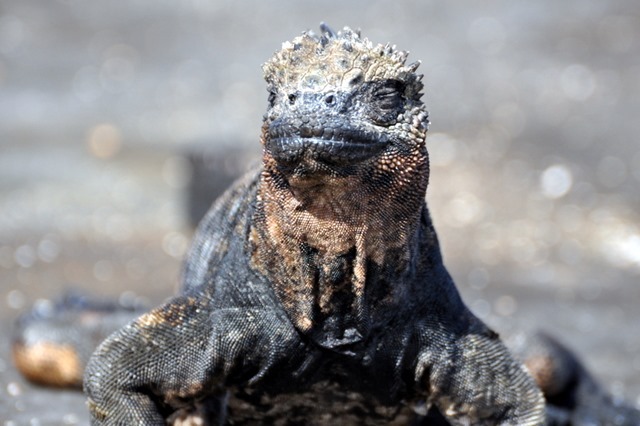 Approximately 25,000 of them inhabit the Galapagos Islands. 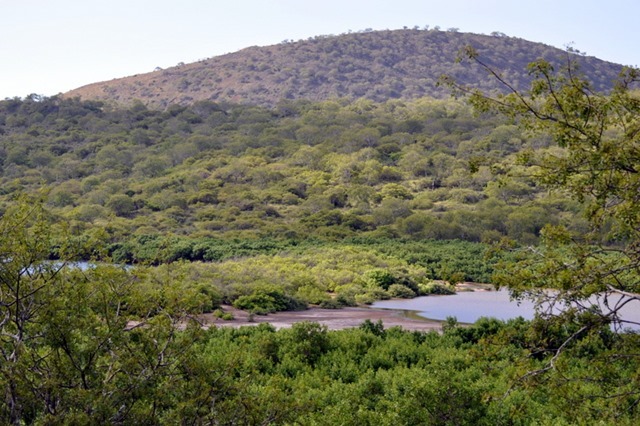 Once our group gathered around our guide, Williams, he took us on a one-mile hike around the island so we could see more of the incredible wildlife. 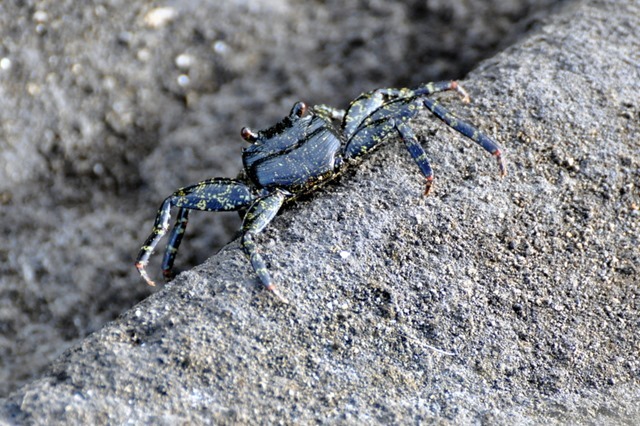 Little crabs, including the bright reddish-orange sally lightfoot crabs, were everywhere! 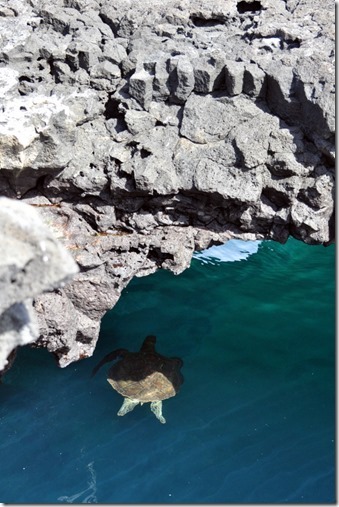 We were also able to spot quite a few sea turtles from the jagged rocks above. They are such graceful animals. 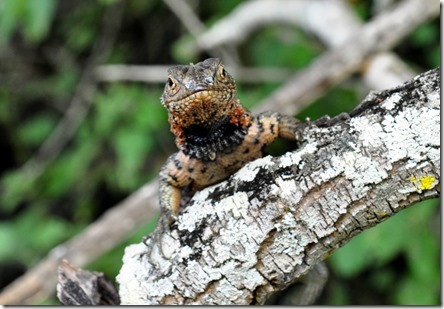 As we continued walking, Williams told us all about the lava lizards that frequently darted across the walking trail around the island. 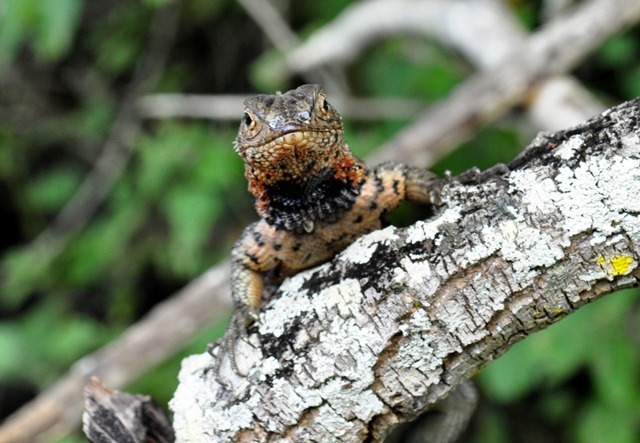 There are seven species of the lizard on the islands and they can lose their tails three times before it will no longer grow back. 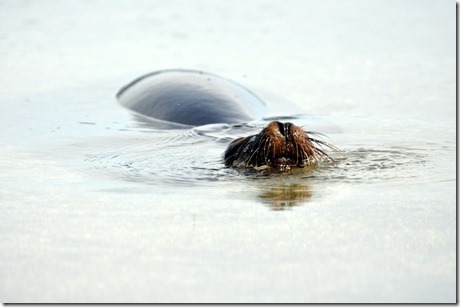 Toward the end of our walk, we stumble upon another sea lion playing in a shallow pool of water. It rolled around in the water, coming up for air and glancing over at us before taking a deep breath and rolling around in the water again. After a brief pit-stop at the boat for a snack, we gathered our snorkeling gear and once again boarded the dinghies which took us right off the shore of Santiago Island where we snorkeled for about 45 minutes. The water was clear and we saw tons of fish and shells, but the highlight was snorkeling alongside a sea turtle. Unforgettable! We also saw a giant ray resting at the bottom of the ocean floor. Our snorkel stop got us awfully excited for the next day’s scuba diving adventure! Once we arrived back on the boat, we ate lunch and relaxed for a bit as the boat sailed to Espumilla Beach. 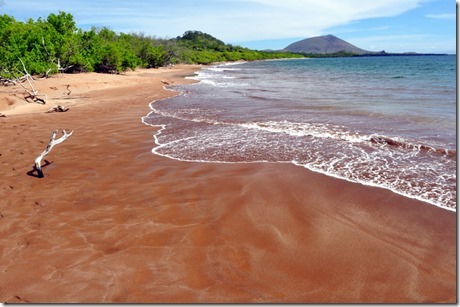 The sand on this beach was soft and thick and created somewhat of a suction around my feet that felt fantastic. 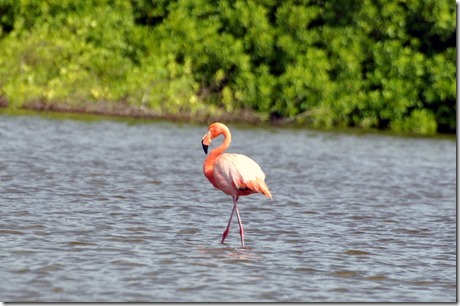 Williams took us on another one-mile hike to see more wildlife and we almost immediately spotted a flamingo. Though I knew flamingos get their color due to their diet and the food that they eat, I didn’t realize that they use their giant bills as a filter, much like a whale, when they eat. Female flamingos lay a single egg that is incubated by both the female flamingo and a male flamingo for approximately 30 days before a baby flamingo hatches. 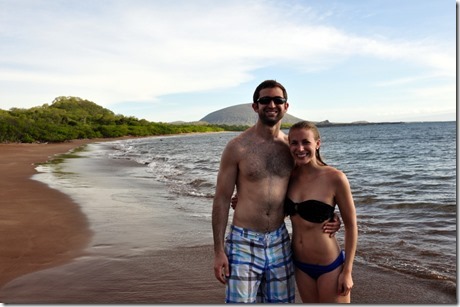 The most exciting part of our time on the island occurred within the last five minutes of our time on the beach. Check out this incredible sight! Williams told us the sea turtle likely hatched only minutes before we spotted it and we all gathered around to watch as the little turtle made a beeline from its nest to the ocean. We knew we were incredibly lucky to watch something so rare and we all rooted for the little turtle to stay safe in the wild waters surrounding the island. 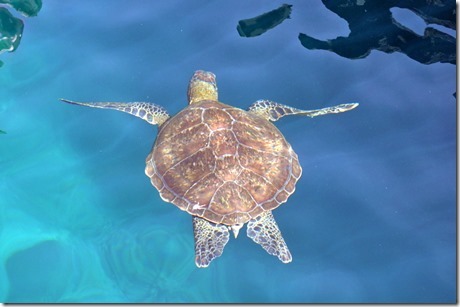 Once the turtle made it into the ocean, we boarded the dinghies back to the boat. 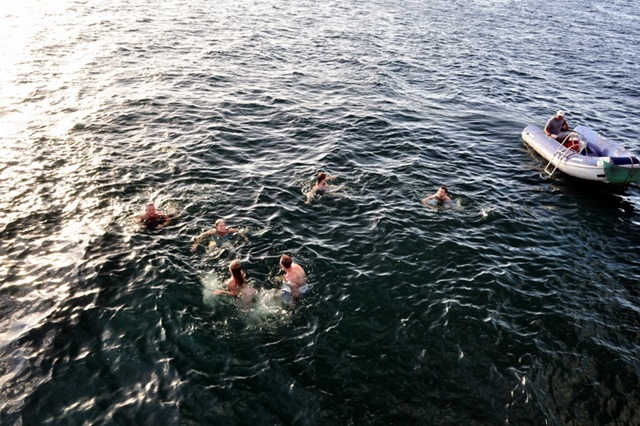 Just as I was about to hop in the shower, Ryan came into our room and asked if I wanted to go for one last swim off the side of the boat with some of our new friends before we set sail for the evening. We had so much fun jumping off the edge and swimming around! 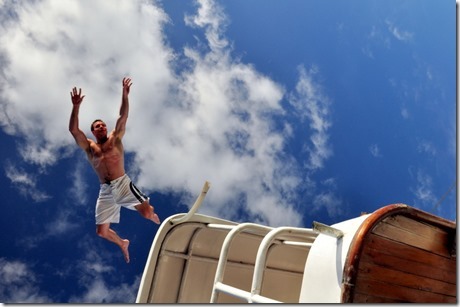 My sister’s boyfriend stood on the deck of the boat and snapped some absolutely incredible pictures of Ryan diving off the top of the boat that we all agreed looked almost unreal! I still can’t get over that picture! The tiny bit of ocean in the top right of the picture makes it seem like you can see the curvature of the earth. Such a cool picture! 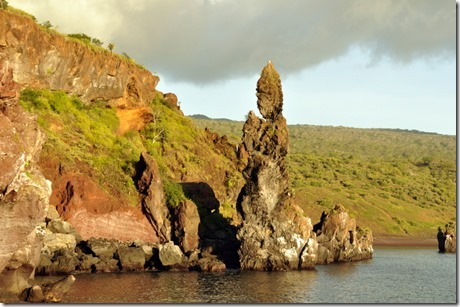 After spending some time in the water, the boat sailed for a few hours to a new location, passing some incredible lava and rock formations, including the Priest. Can you see the priest praying? Pretty cool! 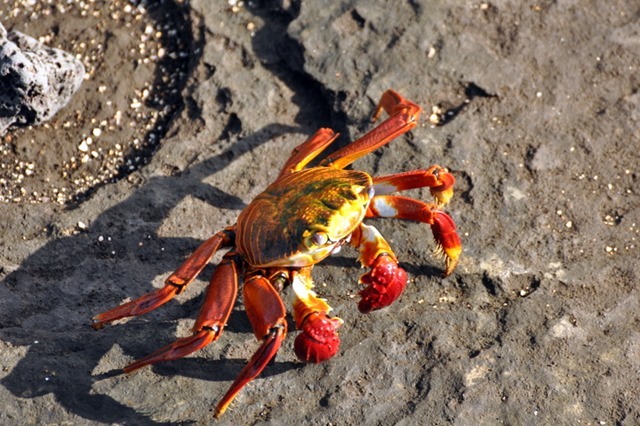 Our second day in the Galapagos Islands was definitely a memorable one! Please email me at pbfingers@gmail.com ASAP! Wow – all that sea life is amazing! I’m not sure I’d want to randomly walk into a crab or iguana though… that might traumatize me for life, but as long as we all kept our distance. Those pictures of the dives with the blue sky in the background really were amazing. Super spectacular! I am such a dork, I started crying seeing that baby sea turtle. It’s my dream to see one of those in my lifetime in person and not on some Discovery Channel special. They are so adorable! LOVE the pics of Ryan at the end, that’s awesome! Thanks for sharing your trip and pictures. We went to the Galapagos in 2009, and it was the most amazing experience! Wow, what an experience! Looks like a blast, and that turtle is sooooo precious! Your photos of the wildlife are incredible!!! They’re so professional looking! 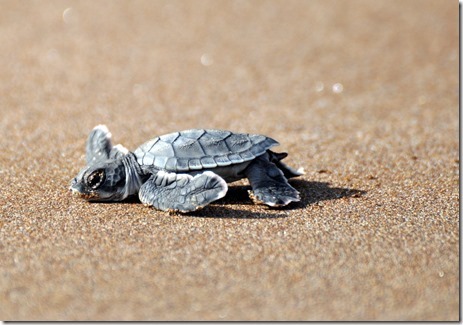 Omg the baby sea turtle! I’ve always wanted to see one make it’s journey to the ocean! 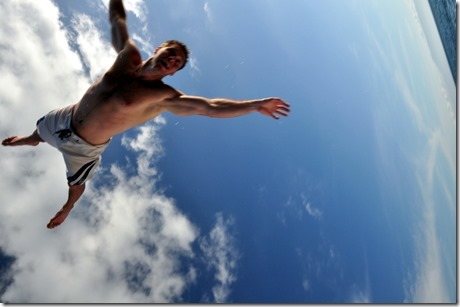 Those pictures of Ryan are awesome, the second one looks like he’s sky diving! It looks like you had a blast! all of your pictures are absolutely amazing!! That baby turtle is adorable, what an awesome sight to see! You captured the wildlife there so amazingly! It’s great they don’t run away when they see you! 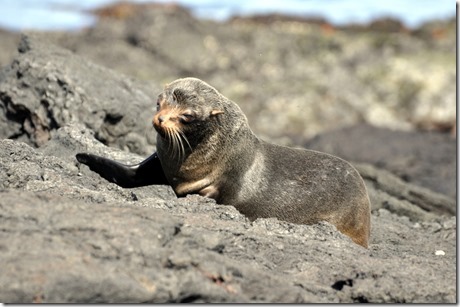 I have a pretty hefty list of desired travel destinations but had never considered going to the Galapagos Islands before reading this series of blog posts. It’s definitely on my list now! 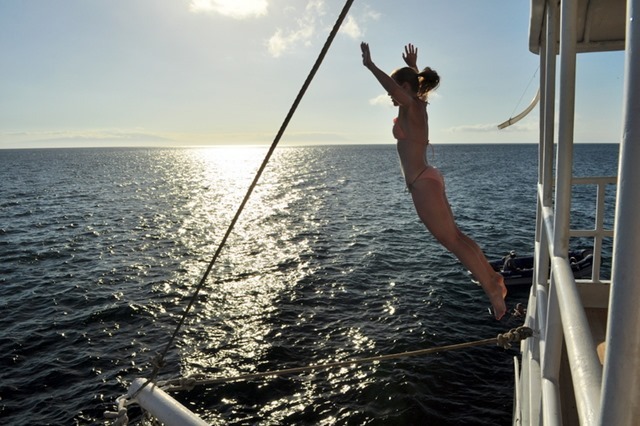 Your trip looks amazing, from the beautiful scenery to the close-up animal sightings, and I love the idea of taking that boat trip to the islands! Gorgeous! Can I tell you that my marine biology background was shining through as I was reading this post? First, I was thinking “I think those are galapagos fur seals” then you added your side note..then I was IDing all the sea turtles (you are so blessed to have seen those sea turtles, they all looked like greens, which are one of my favorite species of sea turtles!) I would have died and gone to Heaven if I was there. So jealous, but thank you for sharing your photos with us! oh my gosh, seriously, once in a lifetime kind of trip Julie! I’m so glad you all had such a great experience and got to see so much amazing wildlife! Gaw, I felt like I was looking at pictures of National Geographic or something, so incredible! I said that I felt like I was in the middle of a National Geographic magazine the whole time that I was there! It was incredible. Wow, looks awesome!! Can’t get over the wildlife! So far, this sounds like it would’ve been my favorite day. I absolutely love marine life and one of my favorite things about my last trip to Hawaii was swimming alongside sea turtles. That baby turtle? Oh my gosh so adorable!! Looks like you had an amazing trip Julie! This is just wildlife heaven. 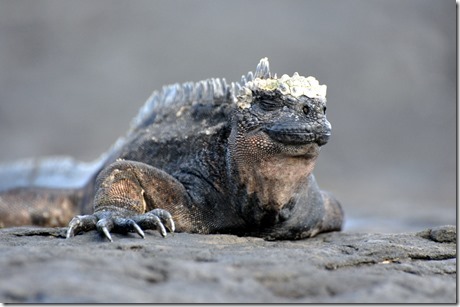 Sea lions, sea turtles, baby turtles, giant iguanas…I’m SOSOSOSO jealous!! It looks so unreal and yet so amazing at the same time. The pictures of you guys diving/swimming are pretty awesome, too! I would absolutely love to have the opportunity to experience all of that! As a teacher it would be really fun to share those experiences and pictures with my students. 🙂 Hope you all have a safe trip back! Gorgeous pictures! I love the baby sea turtle! What breathtaking photos, and what an amazing, once-in-a-lifetime experience you had, seeing that baby turtle! What gorgeous pictures! Thanks for sharing. And sorry Anele, I just laughed out loud at your comment that you “are a dork” because you cried seeing the baby sea turtle. I’m laughing with you, not at you 🙂 He IS an adorable little guy! oooooh seriously, I have refrained from saying this until now but I am so freakin’ jealous!!!! Those photos are amazing and the wildlife looks fantastic! Also, ryan looks like he’s flying in that ast picture! I’ve never been, but your photos look exactly how I imagine Galapgos Islands to be! As if it couldn’t be said enough, gorgeous pictures! The pictures of you all diving and swimming are especially unreal. I went on a trip to Sri Lanka a few years back and took a Safari with my family; seeing all these magnificent animals up close is just breathtaking. Don’t show Sadie any of the pictures, she might get jealous! 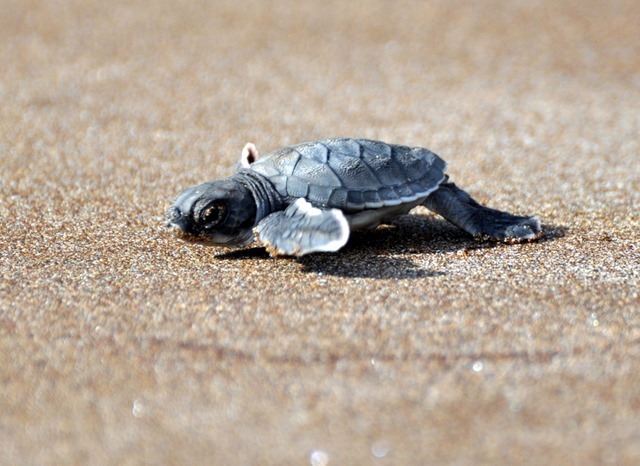 Oh my goodness I am dying at that baby sea turtle!! Those are some awesome pictures! Looks like a ton of fun! 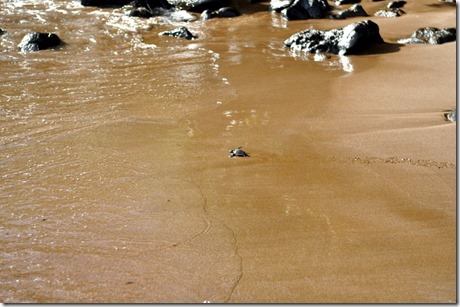 Yay, sea turtle for making it to the water! The odds were against that little guy. Sea lions are some of the cutest animals ever but they also freak me out (just a little bit…). Where are your legs, brother? They’re just one long piece of blubber. Amazing! I can’t believe you guys got to see that baby sea turtle. Gorgeous photos – I can’t wait to read the rest of your recaps! That picture of Ryan is extremely cool and the baby turtle is the cutest thing ever. This looks like one of the most beautiful vacations ever! That baby turtle!!!!! Oh my gosh! Probably the cutest little thing I’ve ever seen! I AM SO JEALOUS!!! Ha! Just seeing these pics makes me want to go back to the galapagos SO BAD. I wish you traveled more often. I absolutely love reading your travel posts! Once again, amazing pictures! TFS! 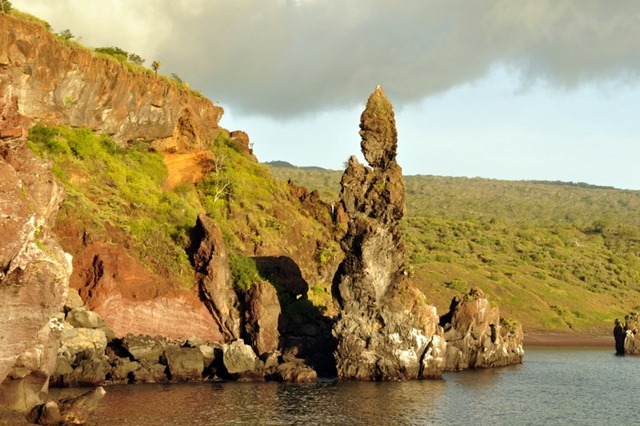 The Galapagos Islands sound and look truly amazing! You’re so lucky that you got to go there! Sounds like a fantastic experience! BTW…I love your pics! What awesome pictures!! Looks like this trip was incredible! 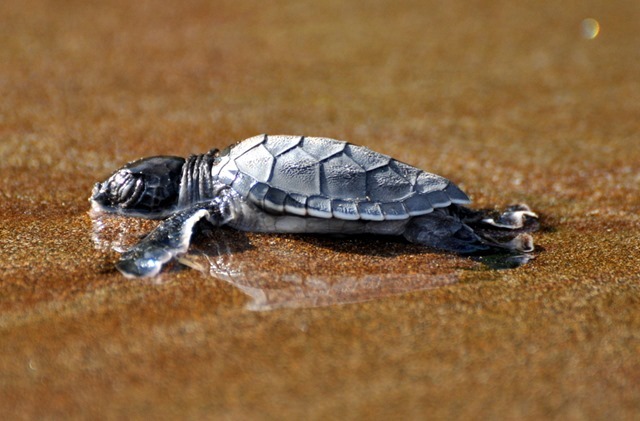 Oh my gosh, those baby sea turtles have to be the cutest thing I’ve ever seen. Makes me think of Finding Nemo. Random thought. Looks like you had alot of fun. I am happy that you took so many pictures to share with us! Those crabs look like the most colorful, unique crabs I’ve seen! I’m living through you. Seriously. Pictures are amazing! thanks for sharing! 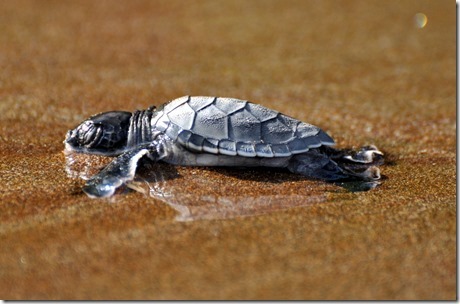 I wish I could see a baby sea turtle! they’re my fav!! So amazing- thanks for sharing! And that baby turtle awww. Can I just say that you have a stellar body! AMAZING! 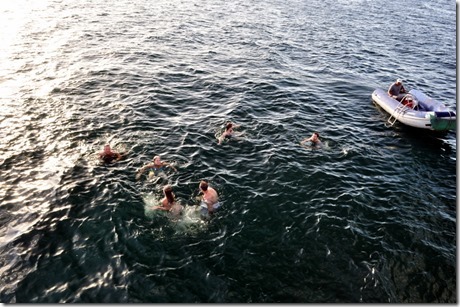 Those pictures of Ryan jumping off the boat are CRAZY! glad you had a good time!